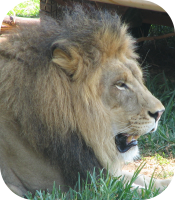 All lions are very vocal and use a snarls and growls to communicate. Size: Lions are the second largest feline species, only tigers are physically larger than lions. 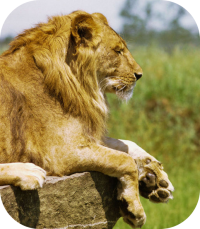 Lions are typically 4 feet tall and are 5 to 8 feet in length. Lions weigh between 265 to 550 lbs. Male lions are typically larger than lionesses. A tigers tail is typically 27-40 inches in length. Habitat: Lions are found almost exclusively in Africa, from the edge of the Sahara to Northern South Africa. A small population of lions are found in northwest India, in the Gir Forest. It is estimated that only 200 to 260 lions are still found in India, they are considered endangered. The habitat that lions are found in range from plains to thick brush and dry forests. Diet: Lions are carnivores they prey on impala, zebra, giraffe, buffalo, and other animals native to their habitat. They will even attack lions, when food is scarce. Lions have also been knowne to scavenge food, stealing from hyenas and ohter predators. Male lions eat approximately 15 lbs of meat a day, on some ocassions they can consume up to 60 lbs of meat. Hunting: Female lions do almost all the hunting. They will work in teams to stalk prey and attack. They typically hunt at night. Social Structure: Lions reside in prides that consist of up to 15 lions. The pride is typically comprised of female lions and their young. A single male typically oversas the pride. Lions are affectionate with others in their pride. Young males are driven from their prides when they become strong enough to challenge, the dominant males leadership. Male lions mark their territory using their scent. The male lions in a pride will also guard the cubs when the females go hunting. If attacked both males and female lions will defend the pride. Lions will often have defined roles in the pride. Adult lions have no natureal predators. Description: Lions are the only member of the cat family where males and females have a distinct difference in their appearances. Most male lions have a thick shaggy mane, while lionesses do not. The mane of the male lion makes them appear larger, and is used to intimidate any animals that they confront. 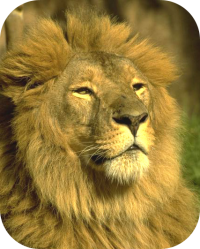 Lions have a yellow-gold coat, and their manes can range from a light blonde to black. They have long tails with a tuft of fur on the tip. A lion's coloring allows them to blend in with the tall grasses on the plains and savannahs camoflauging them while they stalk their prey. Communication: Lions are territorial creatures and mark their territtory with urine. 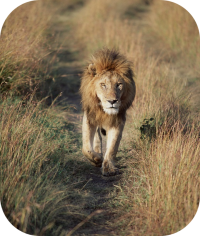 A lion pride's territory can encompass up to 100 square miles. The marking is to warn trespassers. Lions use physical contact as a means of communication, they will often nuzzle members of their pride or groom pride members. Lions also are quite voial and purr, snarl, hiss and roar. Lions have the loudest roar of any big cat. It is estimated that fewer than 21,000 lions remain in Africa. Birth: A lioness will go give birth in a den, and remove herself and her cubs from the pride when giving birth. Lionesses give birth to 3-4 cubs at a time. Lion cubs weigh 3 lbs at birth. The lioness will move her cubs to different dens, several times a month, to avoid the detection of predators. A lioness will not rejoin her pride until the cubs are 6 to 8 weeks of age. Gestation: Lionesses carry their young for approximately 110 days. Lionesses typically give birth every two years. Not all male lions have manes, some lions found in East Africa do not have manes. Cubs: Lion cubs are able to walk after approximately three weeks of age. Lion cubs have spots on their coats, that lighten and disappear as they age. Hyenas and leopards prey on lion cubs. Unfortunately the mortality rate of lion cubs is quite high, and it is estimated that up to 60-70 percent of cubs die before they reach the age of 2. Lion cubs remain with their mother for two years. A lioness will wean her cubs at six to seven months. Sexual Maturity: Lions are considered sexually mature at 3 to 4 years of age. Life Span: The average life span of a lion in the wild is approximately 15 years. A lions roar can be heard over five miles away! Athleticism: Lions are agile and good climbers, they will often rest in trees. They typically have short bursts of energy and activity, typically just after dusk. Lions spend a large amount of their time resting, in fact they can spend up to 21 hours napping and sleeping. Unusual: Lions live in a matriachal society, the prides are run by the females. Lion with a thick shaggy mane resting in the sun.